Making filled pasta is definitely an activity to be saved for days when you have a little extra time. It’s incredibly satisfying, but it does take time and patience. Today I decided to drag out the pasta machine and test out a new filling idea. I’m by no means a pasta expert, I have a lot to learn (as you can see from the picture below! 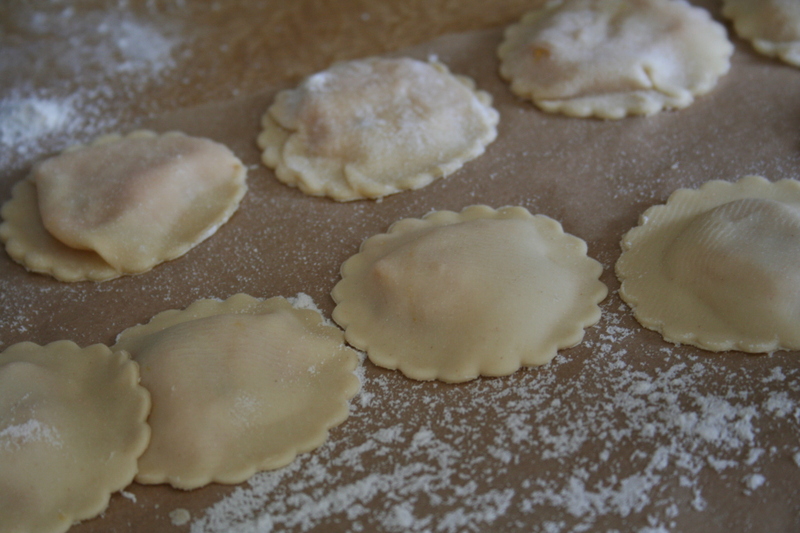 ), but here’s how I made my my ravioli. 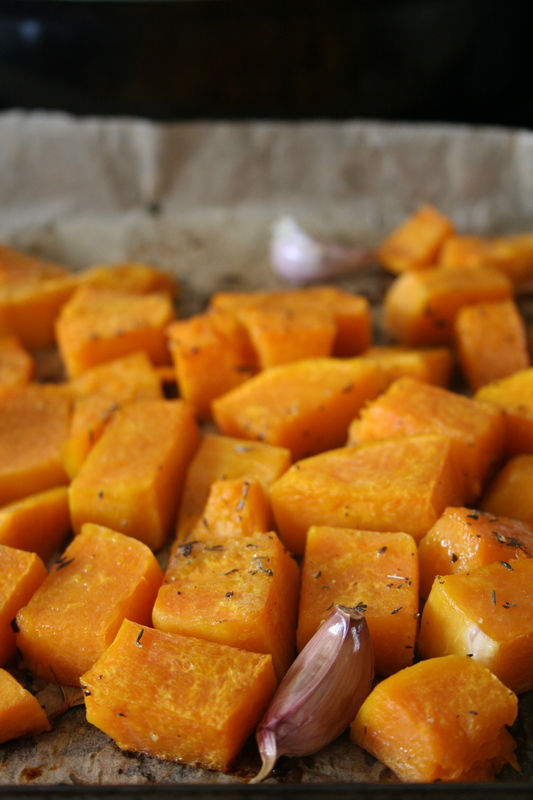 To make the filling, roast butternut squash and whole cloves of garlic with herbs and seasoning. Don’t balk at using five or six – once roasted, garlic becomes wonderfully sweet and really mellows out. After roasting, squeeze the garlic out of the skin and mash the ingredients together. 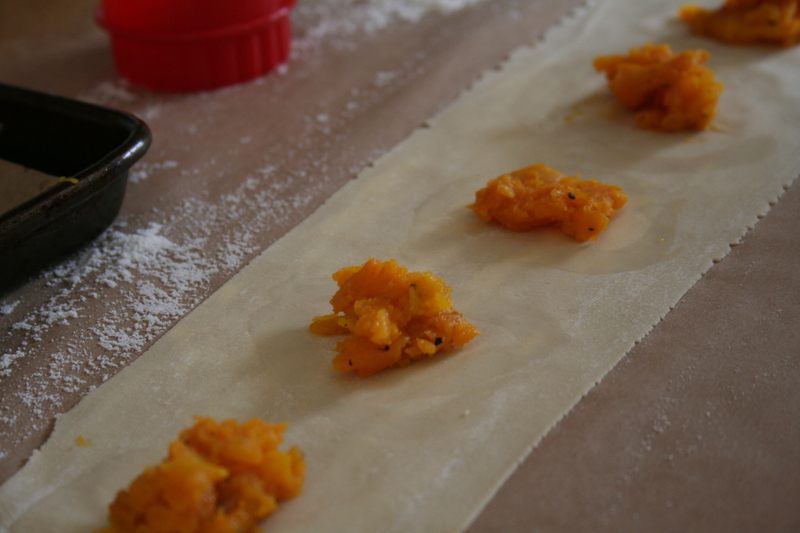 Then take your pasta dough and roll it out as thinly as you can. Place small amounts of the filling onto the sheet of pasta (be stingy – you really don’t need much filling for each ravioli) and run a wet finger around each blob of filling to help the pasta layers stick together. Place another sheet of pasta over the top and press down firmly around the filling, squeezing out any air. 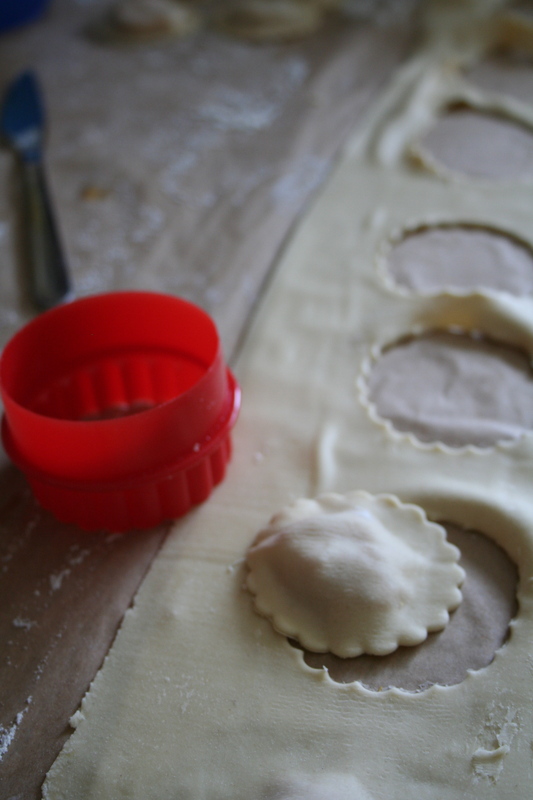 Use a fluted cutter (or a ravioli stamp if you have one). After I’d cooked my pasta I served it simply with lemon, basil, goats cheese and a good sprinkle of freshly ground black pepper. 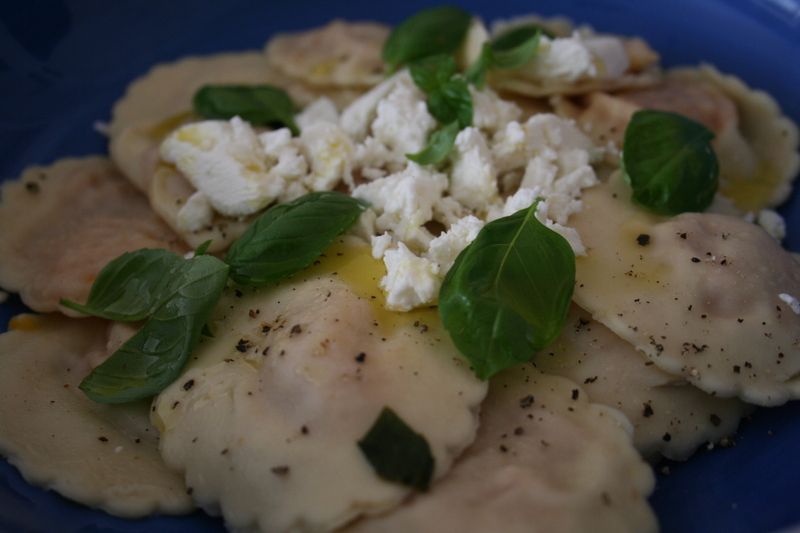 The ravioli filling is sweet, so a nice sharp goats cheese provides good contrast. Here’s the recipe for the filling. I won’t go into detail about how to make the pasta dough, as there is plenty of information available on the internet, but I found that using 1 1/2 cups flour and 2 eggs for the dough gave me the right quantity. 1. Place all the ingredients in a roasting tray (leave the skin on the garlic) and give everything a good shake. Roast at 220ºC for about 25 minutes. 2. Leave everything to cool slightly. Squeeze the garlic out of its skin and remove the bay leaves, then mash everything together so that the filling is smooth. Leave to cool. 3. Roll out pasta dough and fill, as described above. In a small frying pan, gently warm olive oil with some lemon zest, a good squeeze of lemon juice, salt and pepper. Add some shredded basil and drizzle over the cooked pasta. Crumble some goats cheese on top and add some freshly ground black pepper and a few extra basil leaves. ~ by smileysoyabean on 2 July 2012.